We’d love your help. Let us know what’s wrong with this preview of Life in Reverse by Beth Michele. A story about love, life, and second chances. Because I found myself drawn A story about love, life, and second chances. To ask other readers questions about Life in Reverse, please sign up. Is this single or Dual POV? Beth Michele Hi Nicole! This is a Dual POV. I swear, I felt this book in every part of my body. From my face, upon which the ache in my heart was etched, to my hands that couldn't swipe the pages fast enough, to my stomach that fluttered and roiled, down to my feet, which danced as I reached ever closer to 100%, I FELT Life in Reverse. And damn, how I loved it. It was worth the late night tears, the whispered wishes for better and for more and for mistakes to be unmade. It was worth the new wrinkles I'm sure to be seeing on my brow, and t I swear, I felt this book in every part of my body. From my face, upon which the ache in my heart was etched, to my hands that couldn't swipe the pages fast enough, to my stomach that fluttered and roiled, down to my feet, which danced as I reached ever closer to 100%, I FELT Life in Reverse. And damn, how I loved it. It was worth the late night tears, the whispered wishes for better and for more and for mistakes to be unmade. It was worth the new wrinkles I'm sure to be seeing on my brow, and that heartache that kept me captivated. It was worth the endless hoping for the perfect conclusion to make it—to make ME—all better. Perfect really is the best way to describe this book, from start to finish. The angst that simmered throughout keep me invested, and the small breaks of humor and sweet sexiness (the first kiss!!) was a balm to my heart. Beth Michele is a powerful writer, able to make you feel every single word, to make you fall in deep, crazy love with her flawed characters and her heartfelt stories. And honestly, I stood NO CHANCE against Vance and Ember. I fell hard and fast. They were both broken, almost combative, and as that gave way to an intense and obvious connection—which simply radiated from the pages—I was a goner. Not just for Vance and Ember, though. Some of those feels were reserved for lost loved ones, and also for Julian and Avery—and this little fantasy I have going on. You see, I'm in MAD secondary character love with those two, and I'd really, really like to see some more of them. I'm not yet ready to say goodbye, to any of these people. Family. Life. Love. Passion. Truth. Second Chances. Life In Reverse by Beth Michele encompasses every facet of what truly matters in life. This being the first book that I have read from this author, I was amazed with the raw beauty that Beth Michele was able to capture. She intricately layered this story with raw emotions and staggering beauty that readers like myself are overwhelmed with the author’s poetic and lyrical prose. Life In Reverse is a beautifully heartbreaking and astonishing at the same time. Ms. Michele made readers feel the depth of love, life, and honesty. Nothing about this book is simple. With her complex characters, Ms. Michele took an ordinary story but made it more. More than a love story. More than forgiveness. More than just a second chance. Just more. A collision. A life-altering moment. A secret. The truth. Life In Reverse is a story drowning with depth and vulnerability. In life, sometimes we want to hit the pause button, press rewind, or fast forward to the end. And in this story, this book captures this sentiment as Vance and Ember discovers the ups and downs of life. Nothing is meant to be simple but with hard work, love, understanding and honesty, Beth Michele made this book an unforgettable and memorable tale of two imperfect people who were perfect for one another. 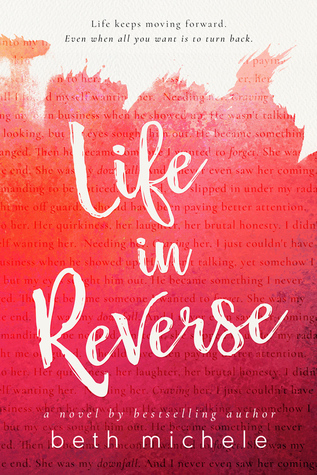 So if you are looking for a story that is seeping with a magnitude of raw emotions then Life In Reverse is the book for you. And just remember to play the happy moments, to pause and rewind the beautiful and unforgettable memories and of course who needs a stop button when life is all about moving forward and stopping the heartbreak. Wow! Once again Beth has blown me away with her words. I absolutely loved every single thing about this story and these characters. When Beth gives me a book I always drop whatever I am doing to dig into her words, and this one I jumped right into and without doubt she nailed it for me. I was in a slump and she pulled me out with Vance and Ember. This is a story of friendship, loss, regret and love. The way Beth builds these characters up in friendship is awesome. One thing I have always loved a Wow! Once again Beth has blown me away with her words. I absolutely loved every single thing about this story and these characters. This is a story of friendship, loss, regret and love. The way Beth builds these characters up in friendship is awesome. One thing I have always loved about Beth and her stories is the build between the characters, sometimes you just do not want that insta love thing. This was one of those times for me. I wanted the build and I enjoyed every single second of it. These two grew into an awesome couple. All in all I will say if your looking for a good story with some awesome characters they scoop this one up I do not think you will be disappointed at all. Thank you Beth for always sending your stories my way. You always bring smiles to my face and love to my heart with your characters. Vance and Ember will always hold a special place within my heart. Once again, Beth proves to me why I love her books so much. This is without a doubt one of my top reads this year!! Vance and Ember...wow where do I start? two broken people who couldn't stand each other at first, but gradually developed a friendship and more. These two made me cry because of what they were going through. Poor Vance...my heart broke for him and when you find out, you'll understand. Ember lost a piece of herself years ago when her family dealt with the unimaginable. Vance moves in Once again, Beth proves to me why I love her books so much. This is without a doubt one of my top reads this year!! Poor Vance...my heart broke for him and when you find out, you'll understand. Ember lost a piece of herself years ago when her family dealt with the unimaginable. Vance moves in the neighborhood Ember lives in but he's so angry and keeps to himself... that is until Ember. What I loved about this story is that it Vance and Ember slowly build a friendship and it was amazing to see. Ember did something for Vance that was so beautiful, it had me in tears and that to me was the turning point in their relationship. I need more tissues. Cried some big ugly tears the last 40% of this one. Review to follow. This second chance romance packed an emotional punch. Vance and Ember’s story built up slowly as we got to know their fragile backgrounds and personalities. These perfectly imperfect characters had it all and lost it after a family secret was uncovered. When their worlds collide again can they I need more tissues. Cried some big ugly tears the last 40% of this one. Review to follow. This second chance romance packed an emotional punch. Vance and Ember’s story built up slowly as we got to know their fragile backgrounds and personalities. These perfectly imperfect characters had it all and lost it after a family secret was uncovered. When their worlds collide again can they hit the rewind button and go back to a time when things were full of promise? Can they forgive, forget and move forward? I shed some big tears while reading Life in Reverse. What a story! Bravo Beth Michele. I'm unsure what truly motivates any character to leave everything that they love aside from what the author shares with us and run,but since it is the engine that drives this novel one cannot do anything but float with the current. Some reasons seem so trivial yet somehow warp the individual's entire sense of direction & like animals sensing danger they pick the easiest route out to escape.I understand it's akin to panic drowning when you tumble beneath a gigantic wave & it's pressing on I'm unsure what truly motivates any character to leave everything that they love aside from what the author shares with us and run,but since it is the engine that drives this novel one cannot do anything but float with the current. Some reasons seem so trivial yet somehow warp the individual's entire sense of direction & like animals sensing danger they pick the easiest route out to escape.I understand it's akin to panic drowning when you tumble beneath a gigantic wave & it's pressing on your chest & you don't know which way is up. I've had the pleasure of reading early copies of Beth Michele's last few books and each time have been delighted with the books. This time around, I was intrigued by the cover first. The prologue grabbed me right away. I can't say much for spoiler purposes, but it kicked off my first round of questions. How did she get this way? Did he have something to do with it? And then chapter one came along and I was hooked. I LOVE broken people finding romance, especially when it's together. And this time a I've had the pleasure of reading early copies of Beth Michele's last few books and each time have been delighted with the books. This time around, I was intrigued by the cover first. I LOVE broken people finding romance, especially when it's together. And this time around is no different. Vance is dealing with many things, and is obviously closed off to anyone except for his family. Even then his relationship with his father is strained. So when he moves to a new town he's not looking to befriend anyone - let alone fall in love. Ember is dealing with her own issues and tragedy. She's never been one to care about relationships. She's more into sculpting - and Mickey Mouse - so meeting Vance (her new neighbor) shouldn't be a complication in her life. They have an instant connection that both try to ignore. We know that never works. The chemistry between these two will drive you mad (in a good way!) and you'll be biting your nails waiting for them to give in to the temptation. Thankfully, this isn't another case of insta-love. This is also why love Beth's books. She takes the time to build the relationship. It's BELIEVABLE. We also get to know both characters as individuals before they figure things out between them. Too often in romance this isn't the case. It's a slow burn, but I swear it's worth it. This isn't just a regular romance. This is a story of friendship. It's a story of loss and rebuilding. It's a story of finding a reason to live. This book was beautiful. Full of friendship and family, love, loss, secrets, regret, & hope. I love how they start out as not really wanting to be friends but cant really deny they have a lot in common. This wasnt insta love or jumping right into a relationship with one another. It was built up slowly. I loved Ember and Vance from the first time they met. if you are looking to follow a connection from friendship to more than this is definitly the book you are looking for. I cannot wait to se This book was beautiful. Full of friendship and family, love, loss, secrets, regret, & hope. I love how they start out as not really wanting to be friends but cant really deny they have a lot in common. This wasnt insta love or jumping right into a relationship with one another. It was built up slowly. I loved Ember and Vance from the first time they met. if you are looking to follow a connection from friendship to more than this is definitly the book you are looking for. I cannot wait to see if there is a story about Embers sister Avery and Vance's brother Julian. I dove into this book without reading the synopsis. I wanted to experience the whole thing for myself. Well, I kinda figured that I wouldn't be disappointed. And i wasn't....at all! I fell in love with the characters immediately. Although, I did get frustrated with their blindness to the obvious. Lol. The story is full of 2nd....3rd chances. It's full of love & loss. It had a cast of colorful characters that you couldn't help but want to get to know as the story developed. This story reminds I dove into this book without reading the synopsis. I wanted to experience the whole thing for myself. Well, I kinda figured that I wouldn't be disappointed. And i wasn't....at all! I fell in love with the characters immediately. Although, I did get frustrated with their blindness to the obvious. Lol. The story is full of 2nd....3rd chances. It's full of love & loss. It had a cast of colorful characters that you couldn't help but want to get to know as the story developed. This story reminds us to never give up on our dreams! Fate will always win! We are left with a happy ending after all the ins & outs. It's a beautiful "love never fails" story that warms your heart. But watch out you will laugh & you may even cry. That's what life is about anyway. We wouldn't know the mountaintops, if we didn't experience the valleys. Beth Michele, I Love you!!! This is actually the first book I've read by this amazing author! Her writing just hooks and captivates you from the beginning. I laughed, blushed and when the inevitable plot twist happened cried like a baby. How about that moment very close to the end? Big ugly tears. The beautiful kind. I love an author who can bring her characters to life to the point that it makes me feel the emotions of the characters. This was perfection, and I'm scrolling right after I finish t Beth Michele, I Love you!!! This is actually the first book I've read by this amazing author! Her writing just hooks and captivates you from the beginning. Life in Reverse was such an amazing read, i love all of Beth's books and was lucky enough to receive an ARC of this wonderful story. 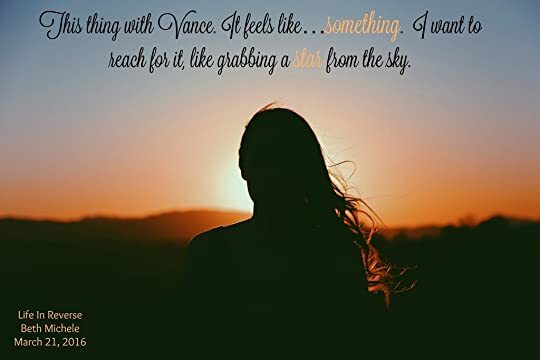 It was such an easy read, I loved the relationship between Vance and Ember and how they both had a difficult period in their life that was able to bring them together. I can't wait to see and read what Beth has in store for us next. This book had be hooked from line one! I read it in one sitting and couldn't put it down! The author has An amazing way about writing what's in the characters heads!! I loved it, and I can't wait to see what she comes out with next!! What a beautiful, emotional story. I felt for each character and went along for the journey with them both. Ember and Vance are both wonderful characters full of love and loyalty. Beautiful story of family and friendship, love and loss, growth and regret. More to come upon release. A quick read with little angst but a ton of baggage. I liked the characters, I just didn’t love them. 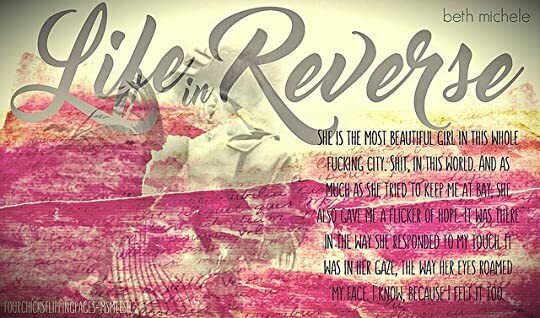 Life In Reverse by Beth Michele is one heck of an emotional read. From the very beginning, she sets a sad tone to Vance and Ember’s story. Both dealing with life altering losses which changes their perception of life in general. We meet two very changed people; new versions of themselves that come about after tragic life events. This was what had me most intrigued about the book. I wanted to get to know the real Vance and Ember. I hoped that Beth Michele would peel off each thick layer of protection they’ve masked to protect themselves from any more hurt, layers that covered who they truly are and Ms. Michele did just that. She did a great job uncovering their frailties, allowing me to go through each coating as they were peeled away. There were moments in this book where I felt like I lost my way. I personally feel like it was because the pacing was a bit too slow for my taste. I had to put down my Kindle a couple of times as a way to reboot. There are so many elements in this book that I really enjoyed and I knew that I had to stay in the moment somehow and as each page began to wane, the very opposite began to happen with my interest. The slow building angst finally began to take root and I couldn’t help but feel re-energized by this. I felt like I finally started to see the other side to Vance and Ember; waking up from the deep state of depression they were in for so much of this book to the realization that life had so much beauty left in it. I loved Ember, I thought she was such a genuine character with a heart of gold. Her relationship with her sister Amber was also one of my favorite parts of this book. Even though they were the polar opposites of one another, the respect and the adoration that existed between them was so lovely to read about. I could feel the bond that existed between the two of them and it actually made me text my own sister letting her know just how much I loved her. Vance was one I didn’t quite know how to feel about in the beginning and I think it’s because Beth Michele did such a great job with his character—the bad boy who didn’t want anything to do with anyone. Rude and uncaring to those outside of his brother, I hated some of the things he’d said and do to Ember in the start of this book. But the best part of that was that when he finally started to let go of all the defense mechanisms he harbored, I began to love him as Ember began to realize how much she loved him too. This book is an emotional roller coaster though I found the pacing a bit slow at times, it had strong characters and even stronger writing. I always look forward to what Beth Michele has in store for me every single time I pick up one of her books. And though Life In Reverse may not be my most favorite, she continues to impress me with her heartfelt words and her expressive plot lines. I would definitely recommend this book to those looking for something to jar their emotions while enjoying the journey alongside charismatic protagonists. You know when it comes to books that Beth writes, I sometimes feel like a broken record or a song that is put on repeat. Never did I think that standalones could hold such a huge place in my heart until Beth graced me several years ago with her story LOVE LOVE! In one book she can captivate anyone and at the end of it, leave you feeling satisfied, gitty, excited and happy! Now, where do you start with this story! The questi You know when it comes to books that Beth writes, I sometimes feel like a broken record or a song that is put on repeat. The loss that was experienced in this story was heartbreaking BUT the love that is also experienced is so refreshing. These 2 characters have battles that they are dealing with. When you aren't living and just existing is it worth the chance to let someone in? Can love survive loss? distance? sadness? At times reading I had no idea what the plot held or how the train was going to travel...or derail! Yes, DERAIL! kept me firm on the edge of my seat, nail biting and all. I am not one who puts out major story details or spoilers, so I will leave you with my review above and hope you love this story (and all of Beth's other books) just as much as I did/do! Beth, I tell you this quite often but I do not think I will ever be able to express enough how much I enjoy your writing, your books and most of all your friendship. You are an amazing writer with amazing characters and a mind that I LOVE lol. Thank you for allowing me the opportunity to receive an ARC of this beautiful story. "I had no idea. I was walking blindly through my days. Never really seeing. Never really knowing. But along came you. Along came life. Along came life." Life in Reverse was a slow buildup of sweet surprise wrapped up in the beautiful story of Vance Davenport and Ember Bennett. The anticipation began to build right from the start between these two young lively characters, the sparks that flew were undeniable, and I loved the gradual pace that was set as they shared little pieces of them "4.5 Stars"
Life in Reverse was a slow buildup of sweet surprise wrapped up in the beautiful story of Vance Davenport and Ember Bennett. The anticipation began to build right from the start between these two young lively characters, the sparks that flew were undeniable, and I loved the gradual pace that was set as they shared little pieces of themselves until they were completely consumed by one another before they even realized it was happening. Through Vance and Ember's eyes we are shown that life can throw the worst at you, crack your heart open, cause you to stop truly living in fear that you will hurt someone the same as you've been hurt. But then someone opens your heart to all the possibilities that life has to offer, knowing that in the end the most important thing is not live "life in reverse" but enjoy life and always live in the moment because it could all be gone tomorrow! When I get a book by Beth, I am always excited, as I know that she will make me cry, laugh, smile and feel. This story is no different. It is a book about love and hate, loss and life . I don't want to spoil anything, as you will enjoy it if you go in blind, so the only thing I want to say is that you won't regret reading it. Two souls, one haunted by the past, one afraid of the future, will connect like two broken pieces that fit together. The hero and his girl are young but mature, with so much to give. We see their journey through knowing each other, loving each other, hurting but always being together. I really liked this book. The characters were so normal and relatable. You have Ember, a girl that is going through life and trying to figure out how to live after a tragedy. Then you have Vance, a guy trying to deal with a tragedy and a very uncertain future. I liked that there was not an instalove with them. They didn't even really like each other in the beginning. Really and truly I liked all the characters in this book. You get to see so many emotions from all the characters. Ember and Vance are both in their early twenties and dealing with a lot. They become friends and I like that even though they are attracted to each other they spend the time getting to know each other. They each have different ways of coping with things and they help the other along the way. As usual all people screw up and they both did. I would say Vance more than Ember but I still wanted to shake her at one point. I realize that this review is vague but I don't want to give anything away. I recommend reading it! I think it was great. I am giving it 4.6 stars out of 5. So in love with this book! This story hooked me from the star and I love every minute. The connection between Amber and Vance was amazing. You could feel the love they had for each other. I loved how vulnerable Amber was in certain parts and so strong in others. Vance my heart was aching for him, he was so lost, he didn't know who he truly was. Vance is this amazing character who has so much to offer but the fe So in love with this book! Vance is this amazing character who has so much to offer but the fears was making him incapable to look forward to he's future. He felt broken and didn't know how to deal with things. I love this book and I hope to see more maybe a book about Julian I love him too. Life in Reverse is an emotional, complicated, romantic AND family story that brings so many struggles to the heart and mind, while learning how to mend and heal. Vance and Ember are twenty-something new neighbors that are drawn to each other immediately, but due to their own histories and demons make sure to keep the other at a distance, until their attraction of heart, mind and body and spirit wins! Join Beth Michele and a slew of amazing supporting characters, as she takes you on a journey of Life in Reverse is an emotional, complicated, romantic AND family story that brings so many struggles to the heart and mind, while learning how to mend and heal. Vance and Ember are twenty-something new neighbors that are drawn to each other immediately, but due to their own histories and demons make sure to keep the other at a distance, until their attraction of heart, mind and body and spirit wins! Join Beth Michele and a slew of amazing supporting characters, as she takes you on a journey of soul searching, love and the true pursuit of happiness! Life In Reverse is a winner!! TAKE A CHANCE ON VANCE!! When Ember and Vance meet they disliked each other. He just moved to her neighborhood and was angry with his father. Ember has been dealing with a loss and her and her sister put off moving to NYC till the end of summer. The fireworks soon spark between them. Problems unfold ripping them apart and they both struggle. Wonderful story even thru some tears. This is a great story about a friendship that goes through so much loss, love. I was happy, sad, hot. these characters are amazing. I loved how Beth allowed Vance and Ember story to grow it started out simple , then we seen how each one grew and how the feelings sparked then how a secret could tear them apart. I loved it. A nice story which took you on a journey, however I felt like the journey was a bit too long. It wasn't a slow burn, just drawn out a tad long and the ending wasn't my favorite, it seemed rushed.